Specs: Summit elevation: 1210′; Base elevation: 910′. 17 Lifts: 1 quad, 2 triples, 7 doubles, 7 rope tows. Uphill capacity: 21,330/hr. Terrain Mix: 39-26-35. Longest Run: 2000′. Season: usually mid-December to mid-March. Night skiing 7 days. 2:00 am skiing on Sat nights Jan-Feb. Rentals & Lessons. Annual Snowfall: 35″. Snowmaking: 100%. The SKInny: Is Alpine Valley the best in the Detroit metro area? Maybe…but that isn’t saying a heck of a lot. It’s what you make of it. Head to AV looking for Alta and you’ll be disappointed. This isn’t Alta…it isn’t even Boyne for that matter, but some of the trails will give you an opportunity to open things up a bit. Not much here for hotshots; wanderers can get a little excited as this is about the most varied terrain in this part of the world. Ideal section for beginners; good fun family atmosphere. Specs: Summit elevation: 700′; Base elevation: 600′. 3 surface lifts. Terrain Mix: 50-50-0. Longest Run: 600′. Season: usually November to March. Open Wed, Thu, Sat & Sun. Night skiing Weds & Thurs. Rentals in town. Annual Snowfall: 160″. Snowmaking: none. The SKInny: Community tow located at 501 Poplar Street, Ishpeming (home of the National Ski Hall of Fame). Operated by the Town Recreation department. No grooming, no snowmaking, just skiing. This is the type of place that built the ski industry, and we wish more towns would operate these hills. Specs: Summit elevation: 820′; Base elevation: 600′. 6 Lifts: 1 quad, 5 rope tows. Uphill capacity: 15,000/hr. Terrain Mix: 40-40-20. Longest Run: 1000′. Season: usually mid-December to mid-March. Night skiing 7 days. Rentals & Lessons. Annual Snowfall: 52″. Snowmaking: 100%. The SKInny: Small ski area that delivers excellent service, quality, etc. Don’t ski Apple Mountain looking for a challenge. Outstanding family atmosphere. Relax. Bay Mountain see listing under Homestead Resort, below. Specs: Summit elevation: 1840′; Base elevation: 1218′. 10 Lifts: 9 doubles, 1 surface. Uphill capacity: 10,800/hr. Terrain Mix: 35-35-30. Longest Run: 5280′. Season: usually late November to early April. Rentals & Lessons. Annual Snowfall: 214″. Snowmaking: 85%. The SKInny: A real contender. In the late 1960s, Big Powderhorn was regarded as the best of the Michigan ski areas. Hotshots will be moderately thrilled, and wanderers will like Big Powderhorn as well. Has a lot of the atmosphere of a big New England ski area: numerous trails, various faces and “peaks,” trailside condos, etc. Lifts can be a bit clunky. Specs: Summit elevation: 700′; Base elevation: 300′. 12 Lifts: 1 quad, 4 triples, 2 doubles, 6 rope tows. Uphill capacity: 12,000/hr. Terrain Mix: 30-60-10. Longest Run: 2700′. Season: usually late November to mid-March. Night skiing 7 days. Rentals & Lessons. Annual Snowfall: 80″. Snowmaking: 100%. The SKInny: Well planned resort suffers from way too many people on weekends. 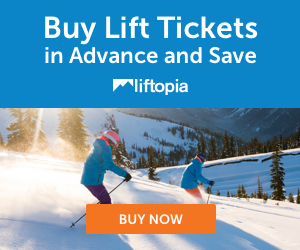 Although liftlines can be quite long, you can sometimes catch a break if you’re willing to settle for the less popular lifts. Not for hotshots or wanderers. Nice long season, relatively easy terrain. Specs: Summit elevation: 1640′; Base elevation: 1175′. 6 Lifts: 4 doubles, 2 rope tows. Uphill capacity: 4,800/hr. Terrain Mix: 20-40-40. Longest Run: 5300′. Season: usually mid December to mid-March. Rentals & Lessons. Annual Snowfall: 210″. Snowmaking: 85%. Specs: 2 Lifts: 1 triple, 1 double. Uphill capacity: 2,500 est. Terrain Mix: 0-7-93. Longest Run: 5300′. Season: usually mid-December to late March. Night skiing Saturdays until 8:00. Rentals. Annual Snowfall: 270″. The SKInny: This is the best skier’s ski area in Michigan, and none of the other ski areas want to emulate it. No lodge. No lessons. No lift ticket required for women. No novice trails. No snowmaking. No child care services. Little or no grooming. Are you getting the picture? Ever want to ski down a frozen waterfall? Two places you can do it: Mad River Glen, and Mount Bohemia. They like to tout Bohemia as Western skiing in the Midwest, but you’d be hard pressed to find many places like this where you can ski legally in Colorado. Yeah, it barely cracks “mid-sized” in terms of vertical, and the lake-effects snow isn’t the fluffy powder of the Rockies. But if you can kick out the jams, Bohemia is it. Do not bring the kids. Men: Do not bring your novice girlfriend just because she can ski for free. Ladies: Do not bring your novice boyfriend just because you can ski for free. Strong intermediates can handle Bohemia, but that’s about the lowest level. Hotshots rule here. Wanderers will love it — assuming they can ski it. The easiest terrain, and usually the first to open, is Bohemia Mining Company. Second in difficulty is the Bear Den area, followed by Bohemia Bluffs then Extreme Backcountry. This last is a series of gladed trails that Bohemia rates as triple black diamonds. Signature Trail: Anything in Extreme Backcountry area; particularly Apex Chute, Slide Path, Enchanted Forest. Specs: Summit elevation: 1290′; Base elevation: 745′. 10 Lifts: 4 quads, 4 triples, 1 rope tow, 1 magic carpet. Uphill capacity: 17,400/hr. Terrain Mix: 37-29-34. Longest Run: 5200′. Season: usually November to early April. Night skiing Wed-Sat. Rentals & Lessons. Annual Snowfall: 140″. Snowmaking: 100%. The SKInny: Owned by the better known Boyne Mountain; similar in a lot of respects. Boyne Highlands has a little more “up” and a little less side to side, and presents a little more for the advanced skier. Has a different “feel,” perhaps a little more upscale, but not to the extreme of a Vail or Stratton. Despite claims, does not have a heck of a lot for the hotshot, but the wanderer will do well. Outstanding family atmosphere. Specs: Summit elevation: 1120′; Base elevation: 620′. 13 Lifts: 1 sixpack, 4 quads, 3 triples, 4 doubles, 1 rope tow. Uphill capacity: 18,000/hr. Terrain Mix: 30-41-26. Longest Run: 5000′. Season: usually November to early April. Night skiing Wed-Sat. Rentals & Lessons. Annual Snowfall: 145″. Snowmaking: 100%. The SKInny: Bohemia may be the biggest/baddest/best, but Boyne is unquestionably the class ski resort of the Midwest. Open meadows, rolling bowls, drops…and with expansion, terrain reminiscent of narrow old New England trails as well. Boyne has top-notch facilities, grooming, and lift equipment. Terrain targets novices and intermediates — the hotshot won’t be overly impressed, but will find some things to do. Wanderers can go bonkers at Boyne, and explore further on the same ticket at Boyne Highlands if they really need to move around (although the two are roughly an hour apart). Specs: Summit elevation: 1330′; Base elevation: 1100′. 17 Lifts: 4 triples, 3 doubles, 10 rope tows. Uphill capacity: 17,200/hr. Terrain Mix: 30-40-30. Longest Run: 1300′. Season: usually late November to mid-March. Night skiing 7 days; Sat until 2:00 am. Rentals & Lessons. Annual Snowfall: 60″. Snowmaking: 100%. The SKInny: Maybe the ultimate suburban ski area: Small, crowded, staff is often frazzled. Terrain is essentially open, rather easy. You have to put in your time at Brighton…learn to ski, learn to ride lifts…and move on. Considering all the elements working against it, Brighton does a decent job providing skiing in Detroit’s back yard. Specs: Summit elevation: 1860′; Base elevation: 1360′. 11 Lifts: 5 doubles, 2 t-bars, 1 pony, 3 rope tows. Uphill capacity: 7500/hr. Terrain Mix: 20-50-30. Longest Run: 5300′. Season: usually early November to late April. Night skiing Wed., Fri & Sat. Rentals & Lessons. Annual Snowfall: 150″. Snowmaking: 100%. The SKInny: Any ski area that has a ski-in, ski-out mid-mountain eatery gets extra points as far as we’re concerned. At Brule, it’s the historic Homestead Lodge. Anyway, as far as the skiing goes, Brule is a great little mountain with something for everyone, and it’s a class act. Good family atmosphere. Maybe not the place for hotshots, but even the toughest can get their blood pumping at times. Wanderers find Brule acceptable. Brule is the Killington of the midwest — not in terms of size, but because of the six-month long season that gives them “bragging rights” over neighboring operations. Signature Trail: Homestead or Big Bear. Specs: Summit elevation: 1545′; Base elevation: 1060′. 6 Lifts: 1 quad, 1 triple, 2 doubles, 2 rope tows. Uphill capacity: 9200/hr. Terrain Mix: 35-33-32. Longest Run: 3960′. Season: usually December to early April. Night skiing 7 days. Rentals & Lessons. Annual Snowfall: 150″. Snowmaking: 100%. The SKInny: Not the most challenging terrain on the planet, but the runs are long as far as Michigan is concerned, and the vertical is decent too. Has the feel of a smaller New York area; some narrower, tree lined trails provide a good descent. Lots of room to roam; wanderers and hotshots will be OK but not overjoyed. Nice place, way cool lodge, way cool online coupon that will save you a couple bucks on your lift ticket. Specs: Summit elevation: 1100′; Base elevation: 850′. 11 Lifts: 1 quad, 1 triple, 1 double, 1 t-bar, 7 rope tows. Uphill capacity: 12,000/hr. Terrain Mix: 35-50-15. Longest Run: 1500′. Season: usually December to March. Night skiing 7 days. Rentals & Lessons. Annual Snowfall: 100″. Snowmaking: 100%. The SKInny: Backyard ski area for Grand Rapidians. The only real challenge is the ice and the crowds; it’s an old open meadow-type operation. Hey, it’s better than nothing. Ideal for beginners and developing skiers. Specs: Summit elevation: 1132′; Base elevation: 757′. 7 Lifts: 1 quad, 2 triples, 2 doubles, 2 rope tows. Uphill capacity: 12,000/hr. Terrain Mix: 19-51-30. Longest Run: 2640′. Season: usually December to March/April. Night skiing 7 days. Rentals & Lessons. Annual Snowfall: 125″. Snowmaking: 98%. The SKInny: Runs are a bit shortish; liftlines can be a bit longish. Hotshots can grind it out a bit on a handful of mogul trails; some steeps will also please (albeit briefly). The layout gives wanderers a bit to do. Decent place; not Michigan’s best but arguably in the top ten. Does a lot with very little vertical; pleasant family atmosphere and good base facilities. Have to double-check the vert, because when I visited this place it just seemed like more than 375′. Signature Trail: Basin Street or Buck. Specs: 3 surface lifts plus 1 tubing lift. Ski Chalet with facility rental. Season: usually mid-December to mid-March. Monday, Thursday & Friday 4:00pm – 8:30pm; Sat/Sun 12:00 – 6:00 PM. Lessons. Annual Snowfall: 50″. Snowmaking & grooming. The SKInny: Town tow with excellent conditions and facilities. Never been to a town tow? Not surprising…most kids are not fortunate enough to have these in their communities because the people who run the community aren’t smart enough to realize how valuable they are. I bet the kids in Gladstone know how important it is. If you’re ever in the neighborhood, buy a ticket or two — even if you don’t have your skis with you — show your support. Town tows like this are that important. Specs: 3 Lifts: 1 t-bar, 2 rope tows. Uphill capacity: 1,800/hr. Terrain Mix: 50-50-0. Longest Run: 2640′. Season: usually December to March; Thu-Sun. Night skiing Thu/Fri/Sat. Rentals & Lessons. Annual Snowfall: 60″. Snowmaking: 75%. The SKInny: Another community rec department that’s way ahead of the curve. Skating rink, tubing and sleigh riding area, XC trails, cozy lodge, horse-drawn sleigh rides…and a legitimate little ski hill with a couple of decent trails and open bowls. You can’t beat it. Essentially Michigan’s oldest ski area; opened in 1929 as Grayling Winter Sports Park and evolving into Bear Mountain Ski Resort before being taken over by community volunteers in 1973. Operated today by the Grayling Recreation Authority, and we’re glad they do. This little ski area rates a visit by anyone who considers themselves a serious skier. Specs: Summit elevation: 973′; Base elevation: 733′. 5 rope tows. Terrain Mix: 12-63-25. Longest Run: 1500′. Season: usually December to March; 7 days. Night skiing Mon-Sat. Rentals & Lessons. Annual Snowfall: 60″. Snowmaking: 50%. The SKInny: Community ski area run in conjunction between the city of Traverse Hills and the Grand Traverse Ski Club. The lodge, snow making, grooming, lighting and other infrastructure is all first class — this is a town tow that has been in operation since 1950, and the quality and pride shows. Excellent learner programs. Specs: 7 lifts: 2 doubles, 2 t-bars, 3 rope tows. Longest run: 1800′. Season: usually December to March. Night skiing 7 days. Rentals & Lessons. Annual Snowfall: 120″. Snowmaking: 100%. The SKInny: Non-profit community hill that relies heavily on donations, fundraising, etc. and sets ticket/seasons pass prices based on budget projections. According to their official statement, “this entire project is about providing affordable ski services to the youth of the community.” Think a small community ski area can survive knowing that most fail? I don’t know either, but I do know that you can make a tax-deductible donation; just visit the website for details. Great facilities, wholesome atmosphere. Specs: Summit elevation: 1330′; Base elevation: 1100′. 13 Lifts: 7 doubles, 6 surface. Uphill capacity: 18,000/hr. Terrain Mix: 22-39-39. Longest Run: 2100′. Season: usually late November to mid-March. Night skiing 7 days. Rentals & Lessons. Annual Snowfall: 42″. Snowmaking: 100%. The SKInny: Many regard Mt. Holly as the best ski resort in the Detroit metro area, but uh, that isn’t saying much. Well, let’s not be too harsh. This is suburban skiing, lots of bodies, small landfill mountain, and that’s a tough deal to manage as effectively as Holly (or any Detroit area) does. It’s a little over an hour north of the city, which makes it an ideal training ground for families. Specs: Summit elevation: 875′; Base elevation: 500′. 5 Lifts: 2 triples, 1 double, 1 rope tow. Uphill capacity: 3300/hr. Terrain Mix: 25-55-20. Longest Run: 1320′. Season: usually late December to mid-March Tu-Sun, open Mon holidays only. Night skiing til 8:00 pm. Rentals & Lessons. Annual Snowfall: 150″. Snowmaking: 100%. The SKInny: Quirky little ski area with nice trail layout, uncrowded. Resortish, Disney atmosphere…everything is pretty and new, cute. Hotshots and wanderers will bore quickly. Specs: Summit elevation: 1935′; Base elevation: 1297′. 9 Lifts: 1 quad, 1 triple, 3 doubles, 2 t-bars, 1 poma, 1 rope tow. Uphill capacity: 10,000/hr. Terrain Mix: 21-37-42. Longest Run: 5300′. Season: usually late November to early April. Rentals & Lessons. Annual Snowfall: 210″. Snowmaking: 90%. The SKInny: Upside-down ski area that essentially has two faces, one main and one smaller. With plenty of snow, trees, and a decent pitch, Indianhead skis like a bigger mountain than it is. Seldom crowded, lines are usually short. Good atmosphere for families as well. Easily within the top ten in Michigan, perhaps the entire Midwest. Only downer is that the conditions are seldom as good as advertised. Specs: Summit elevation: 1800′; Base elevation: 1200′. 4 Lifts: 3 doubles, 1 handle tow. Uphill capacity: 4600/hr. Terrain Mix: 15-50-35. Longest Run: 8300′. Season: usually late November to early April, 7 days. Night skiing except Mon. Rentals & Lessons. Annual Snowfall: 210″. Snowmaking: 95%. Specs: 3 rope tows. Terrain Mix: 80-20-0. Longest run: 1000′. Season: usually December to March, M-W-Th-Sa-Sun. Night skiing M-W-Th. Rentals & Lessons. Annual Snowfall: 130″. Snowmaking: 90%. The SKInny: Five-run hill operated by the city of Charlevoix. Ski a bit, then enjoy the sledding hill (open 7 nts/wk). It’s winter…what more could you ask for? Boyne and a bunch of others are close by, but as a true skiing enthusiast, you recognize that the least you can do for your sport is to buy a ticket and make a few runs down this little slope. The Lodge at Mt McSauba is fantastic. Life is hectic, ski here and turn it down a notch or two. Specs: 2 rope tows. Terrain Mix: 40-40-20. Longest run: 1300′. Season: usually December to March, Sat & Sun. Night skiing M-W-Th. Rentals. Annual Snowfall: 90″. The SKInny: Another community operated tow in the snow belt. Gentle rolling trails, an ideal winter haven for local kids while mom shops on Saturday. Takes you back to a kinder, gentler era. We could all use some of that. Specs: Summit elevation: 400′; Base elevation: 200′. 5 rope tows. Terrain Mix: 20-30-50. Longest run: 1500′. Season: unknown. Night skiing. Lessons. Annual Snowfall: 70″. Snowmaking. The SKInny: Rather new ski area as Michigan goes. Not heavily used. Seems to target the snowboarding market, but we really have very little information on this area. Specs: Summit elevation: 1148′; Base elevation: 728′. 2 Lifts: 1 double, 1 t-bar. Uphill capacity: 2000/hr. Terrain Mix: 52-50-25. Longest run: 1500′. Season: usually December to March, 7 days. Night skiing except Sun. Rentals & Lessons. No day skiing on weekdays. Annual Snowfall: 250″. Snowmaking: 100%. The SKInny: Tough, steep, and cheap. Classic Michigan ski area — not enough vertical, but makes up for it with steep wide trails and plenty of them. Owned and operated by Michigan Tech. Intermediates should stick to the chair, novices should stay away. Hotshots will be put to the test by these short but challenging drops. Wanderers will be ok, but not thrilled. Probably one of the best small verticals in the country. And…it’s a college town. Mott Mountain See Silver Ridge Resort, below. Specs: Summit elevation: 700′; Base elevation: 570′. 2 Rope tows. Uphill capacity: 700/hr. Terrain Mix: 50-50-0. Longest run: 1000′. Season: usually December to March, Th-Sun. Night skiing. Lessons. Annual Snowfall: 60″. Snowmaking: 100%. The SKInny: In case the $8 ticket is just too steep, a $4 bunny hill pass is also available. Hmm. This is a community operated tow right in the city limits of Grand Haven. Doing business in the Grand Rapids area? Rent some stuff, spend an hour. It’ll be the best eight bucks you’ll spend this season. If you go M-W bring a sled of some sort; skiing is closed but the sleigh riding is simply fantastic. Specs: 5 Lifts: 1 triple, 2 doubles, 1 handle tow, 1 rope tow. Uphill capacity: 2,500/hr. Terrain Mix: 33-34-33. Longest Run: 5300′. Season: usually late November to March, 7 days. Rentals & Lessons. Annual Snowfall: 100″. Snowmaking: 100%. The SKInny: Upside-down ski area with pleasant, tree-lined trails. Good mix for the beginner as well as the advanced skier. Not as polished as some of the bigger-name U.P. resorts; makes up for it with value. Specs: Summit elevation: 1338′; Base elevation: 911′. 8 Lifts: 3 quads, 3 triples, 2 doubles. Uphill capacity: 15,000/hr. Terrain Mix: 31-48-21. Longest Run: 4620′. Season: usually late November to early April, 7 days. Night skiing except Tues & Sun. Rentals & Lessons. Annual Snowfall: 130″. Snowmaking: 100%. The SKInny: Known for outstanding conditions, minimal frills. It’s a bit like three small ski areas wrapping in and around the mountains; Nub’s Nob, Nub’s Nob South, and Pintail Peak. The main face is still one of the Lower Peninsula’s most beloved ski hills. South and Pintail add more dimension. The hotshot can get mildly excited about a couple of trails, while the wanderer will like Nub’s as much as any in the state. Specs: 6 rope tows. Uphill capacity: 1,500/hr. Terrain Mix: 33-34-33. Longest Run: 500′. Season: usually late December to March, 7 days. Night skiing Mon-Sat. Rentals & Lessons. Annual Snowfall: 75″. Snowmaking: 100%. The SKInny: Suburban winter version of a waterpark type operation emphasizes snowboarding, pleasant community atmosphere. Also offers tubing, X-C, etc. Specs: 1 rope tow. Uphill capacity: 1,500/hr. Terrain Mix: 33-34-33. Longest Run: 500′. Season: usually late December to early March, 7 days. Night skiing 7 days. Annual Snowfall: 160″. No snowmaking. The SKInny: Town tow originally funded by the Petoskey Rotary Club in 1928, steadfastly maintained by the same group and other caring members of the area ever since. Great facility, deserves support. Specs: Summit elevation: 1300′; Base elevation: 1000′. 10 Lifts: 4 triples, 1 double, 5 rope tows. Uphill capacity: 9600/hr. Terrain Mix: 30-35-35. Longest Run: 1320′. Season: usually December to March. Night skiing 7 days. Rentals & Lessons. Annual Snowfall: 60″. Snowmaking: 100%. Specs: Summit elevation: 1650′; Base elevation: 1150′. 6 Lifts: 1 triple, 2 doubles, 2 surface. Uphill capacity: 3,000/hr. Terrain Mix: 30-40-30. Longest Run: 5280′. Season: usually late November to early April, 7 days. Night skiing Weds-Sat. Rentals & Lessons. Terrain Parks. Annual Snowfall: 60″. Snowmaking: 100%. The SKInny: Long-established resort. Unfortunately, some of the equipment is that way too, but that’s a minor issue. Very good novice/intermediate skiing, ideal for families — perhaps one of Michigan’s best for families. Hotshots will be a bit bored here. Specs: Summit elevation: 1368′; Base elevation: 727′. 4 Lifts: 1 triple, 1 double, 1 t-bar, 1 handle tow. Uphill capacity: 3600/hr. Terrain Mix: 21-50-29. Longest Run: 5800′. Season: usually December to early April, 7 days. Rentals & Lessons. Annual Snowfall: 200″. Snowmaking: 100%. The SKInny: The “Porkies” ski area is within Porkies Mountains Wilderness State Park and offers one of the best verticals in the midwest. Lifts positively crawl to the top, but otherwise this is an outstanding ski area. Outstanding views, and some challenging trails. Low prices, uncrowded, fantastic snow. Hidden Valley Trail is one of the hidden gems of the midwest. Specs: Summit elevation: 1125′; Base elevation: 675′. 11 Lifts: 5 quads, 2 doubles, 4 rope tows. Uphill capacity: 11,000/hr. Terrain Mix: 30-33-37. Longest Run: 5280′. Season: usually November to early April. Night skiing. Rentals & Lessons. Annual Snowfall: 200″. Snowmaking: 100%. The SKInny: Shanty Creek is like two ski areas in one; Schuss Mountain being the main area, Summit Mountain is a newer, “upside down” area that has a more “open” feel. Overall, this is one of those golf/condo/shopping resorts that provides skiing because, well, because you’ll only pay so much for those other pursuits. Resortish, tame, family-type skiing. Specs: Unknown; reported two trails. The SKInny: ski/tubing hill near Mackinac Bridge. Specs: 4 Lifts: 1 double, 3 rope tows. Uphill capacity: 2500/hr. Longest Run: 2500′. Season: usually December to late March, Mon-Sun. Night skiing Mon-Sat. Rentals & Lessons. Annual Snowfall: 30″. Snowmaking: 80%. The SKInny: Formerly Mott Mountain. Smallish, golf-course type ski area; pleasant atmosphere. Specs: Summit elevation: 1515′; Base elevation: 1305′. 6 Lifts: 1 double, 5 rope tows. Uphill capacity: 5400/hr. Terrain Mix: 15-75-10. Longest Run: 1800′. Season: usually December to mid-March, 7 days. Night skiing Fri & Sat. Rentals & Lessons. Annual Snowfall: 62″. Snowmaking: 100%. The SKInny: A golf course tow/lift operation. Open terrain, bigger than it appears. Upside-down design. Saturday twilight ticket is an excellent deal. Mostly gentle country club slopes. Specs: Summit elevation: 1230′; Base elevation: 1020′. 5 Lifts: 1 triple, 4 rope tows. Uphill capacity: 3600/hr. Terrain Mix: 30-50-20. Longest Run: 800′. Season: usually December to mid-March, 7 days. Night skiing Mon-Sat. Rentals & Lessons. Annual Snowfall: 60″. Snowmaking: 100%. The SKInny: Nice little golf course tow/lift operation. Nothing to get excited about, unless you happen to be in or near Harrison, in which case you should be darn glad to have this place. Excellent for beginners. Mucho snowboarders. Specs: Summit elevation: 1100′; Base elevation: 610′. 6 Lifts: 1 triple, 5 doubles. Uphill capacity: 3600/hr. Terrain Mix: 30-40-30. Longest Run: 5100′. Night skiing Mon-Sat. Rentals & Lessons. Annual Snowfall: 182″. Snowmaking. The SKInny: No report to date. Resort has been financially troubled; a “Friends of Sugar Loaf” group is trying to buy it, etc. Status of this hill is unknown. Specs: Summit elevation: 1200′; Base elevation: 975′. 7 Lifts: 2 quads, 1 triple, 4 rope tows. Uphill capacity: 9,800/hr. Terrain Mix: 20-60-20. Longest Run: 1800′. Season: usually late December to mid-March. Night skiing 6 days, Sun til 7:00 pm only. Rentals & Lessons. Annual Snowfall: 60″. Snowmaking: 100%. The SKInny: Sort of a big open pasture with lifts running hither and yon and trails that form a big triangle. Quirky, sometimes crowded, usually maximum fun. Outstanding for beginners and families. This resort isn’t afraid to build jumps and that sort of thing, and usually has decent conditions. Specs: Summit elevation: 850′; Base elevation: 610′. 10 Lifts: 1 quad, 1 triple, 2 doubles, 6 surface. Uphill capacity: 10,000/hr. Terrain Mix: 20-70-10. Longest Run: 2000′. Season: usually December to mid-March. Night skiing 7 days. Rentals & Lessons. Annual Snowfall: 60″. Snowmaking: 100%. The SKInny: Nice little ski area with surprising amount of room to roam, however, runs are short. Nothing here for the true hotshot. Great area for beginners and developing skiers. Specs: Summit elevation: 1345′; Base elevation: 1120′. 7 Lifts: 3 triples, 1 double, 3 rope tows. Uphill capacity: 6600/hr. Terrain Mix: 30-50-20. Longest Run: 2200′. Season: usually November to late March. Night skiing 7 days. Rentals & Lessons. Annual Snowfall: 150″. Snowmaking: 100%. The SKInny: This is yet another golf/disney/resortish/shopping destination that happens to offer skiing. Lots of kids, families; all of it very tame and orderly. Great place for a vacation, not a great place to ski. Tyrolean Hills No information available. Specs: Summit elevation: 1500′; Base elevation: 1200′. 2 Lifts: 1 double, 1 rope tow. Uphill capacity: 1600/hr. Terrain Mix: 25-50-25. Longest Run: 2640′. Season: usually mid-December to last day of February. Some night skiing. Operational schedule is a bit unusual; click link for list of open days. Rentals & Lessons. Annual Snowfall: 200″. Snowmaking: 35%. The SKInny: Interesting ski area owned and operated by Gogebic Community College, fortunately is open to the public…which means decent skiing, cheap lift tickets. It’s the “laboratory” for Gogebic’s Ski Area Management program. (Whether or not they offer a degree, I don’t know…) As for the skiing, it’s typical small midwest, usually good U.P. snow. Sometimes crowded, but usually not. Skiing the trails, the mountain “feels” bigger than it really is. Well worth a visit — deserves support from the skiing community.